Humans have always been on the move. And, as our inquisitiveness grew larger, humans began to travel. In the Neolithic age we saw the appearance of the first sailing vessels and the invention of the wheel, and after some time Ancient men already used caravans for traveling around the world. In the Medieval times, the most notorious travelers were pilgrims and missionaries. In the late 16th century it became fashionable for young aristocrats to travel to important, fabulous and enchanting European cities. It was the time when such destinations as Paris, London, Venice and Rome were visited by people to expose themselves to the great masterpieces (so-called Grand Tour). Then, with the coming of rail transit, steam, and steel the travel industry revolutionized. The wars (the First and the Second World Wars) increased interest in international traveling. And with the evolution of aviation technology and hotel industry and the emergence of the Internet, tourism has become very popular and affordable. By now, traveling has become a global phenomenon with massive infrastructure. Indeed, it is a branch of the global economy with the most vigorous growth. Today’s travel industry is about global travel distribution including GDS (global distribution systems), hotel reservations and airline booking systems, large complex databases, web and mobile applications. In this post, we’ll consider GDS role, growth, and future perspectives. A global distribution system, or GDS, is a computerized and centralized network that allows automated travel-related transactions between travel service providers (airlines, car rental agencies, hotels, etc.) and travel companies (both online and office-based), covering everything from airline tickets to hotel rooms. Global distribution systems were originally established for the integration by airlines but then were expanded to travel agents. 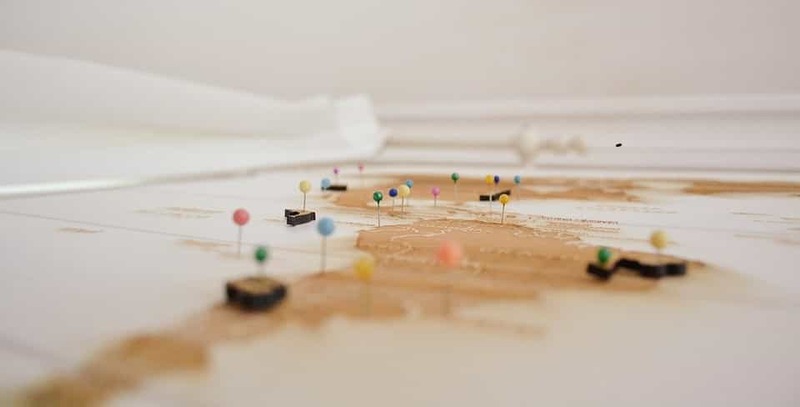 A GDS platform connects services, rates and bookings consolidating products and services across the three main travel sectors: car rentals, airline and hotel reservations. In other words, GDS is the system that links airlines, hotels and car rental agencies to online booking sites and travel agents. A GDS network emerged back in the 1960s with the appearance of the technologies, used to handle travel-related transactions. Since the general aviation started evolving after World War II, air ticket orders were placed by phone, so there was a need for digital tools that would automate the work of airlines and reservation systems, connecting travel industry members. Global distribution systems have significantly changed the way people traveled and the work of travel companies as well. With GDSs, independent travel agents, travel companies, and online agents have a remote access to airline reservation databases, can place remote bookings (thus automating the booking process), and meet their customer needs by looking the database for the best available offers. Also, GDS systems provide such travel-based technology services as airline information technology products and revenue management tools for hotels, airlines, and car rental agents. What’s more, they offer travel agent interfaces, integrating travel companies into a GDS network. Take a look at the representation of today’s travel distribution industry. For now, the key players in the global travel distribution system environment are Sabre, Amadeus, and Travelport (Galileo, Apollo, Worldspan), generating billions of dollars in travel technology services. Such large complex GDS platforms allow travel agents to get access to customer and reservation databases, inventory of hotels, airlines, car rental agencies, etc., – everything in real time. No doubt, that today GDS systems take an important part in global travel distribution, simplifying the work of travel agents. Though their traditional role is changing under some factors, GDS providers continue to have their top lines. Now the number of online travel sites providing price comparisons is quickly growing. Also, travel service providers are working toward pushing customers to book their services directly via their websites without any intermediaries, like it is in the case of GDS. For instance, to motivate clients to directly purchase air tickets, some airlines impose additional fees for them booked via a GDS platform. Then, there may appear new solutions, that make data more useful, rich, and advanced for travel companies. The technology may change and become more customized to client specific needs and preferences such as leisure travel. Blockchain innovative technology is another growth perspective for travel distribution landscape. As you probably know, it has a wide potential for many business fields besides banking and finance, and the travel industry is not an exception. Imagine a platform that allows travel agents to access it with tokens, as well as list their inventory and place travel-related transactions on the Blockchain. 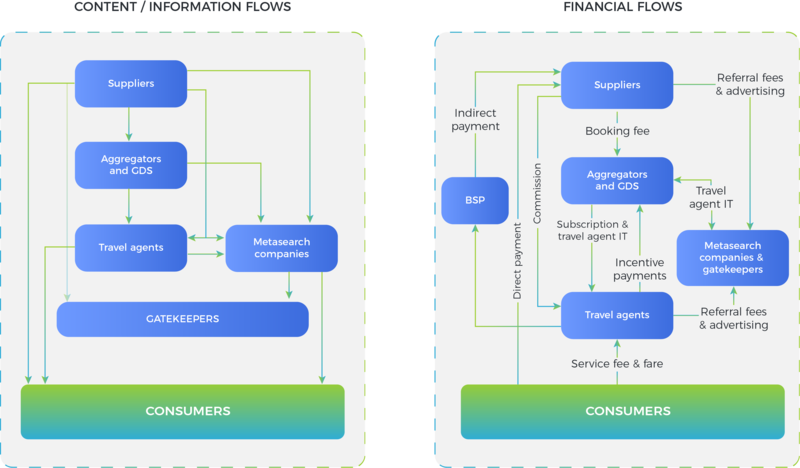 Thanks to Blockchain integration, travel providers will be able to sell services almost for free, instead of paying global distribution systems for access to their large databases or for transaction facilitation. What’s important, Blockchain provides high-security level: it consists of multiple transaction blocks, built according to certain rules and linked and secured using cryptography. Using the technology, companies will be able to reduce expenses on audit, if it’s carried out on Blockchain transparent ledger. Another example of Blockchain potential for the travel industry is additional possibilities for startups. Imagine, for instance, a travel booking startup that strongly needs to integrate into the field and wants to become a great market player, but has no opportunity to join a GDS network to access its databases and other information because of high costs. Here the implementation of Blockchain solution can really help by enabling travel agents to list and sell their products and services directly on Blockchain platform, providing lower prices compared to those of traditional global distribution systems. Also, travel agents can minimize their dependency on GDS systems by developing a private Blockchain for business specific needs. So, instead of using the public distribution system, a company will be able to make the technology only for internal use by selected participants. Thus, though at present global distribution systems take an important part in the travel industry, the dependency on them is likely to decrease. However, it means the search for new opportunities, business models, and digital tools.